Reinforced mesh is "sandwiched" between layers of polyurethane - increases durability and resistance to tearing. Unique, urethane construction allows the pad to deform and seal off most drains � temporarily "seals" to any smooth surface. A valuable addition to any emergency response plan, spill kit or storm water management program. Unlike some alternative products, BOTH sides will quickly seal drains - there is no specified "top" or "bottom". Flexible, non-absorbing material with reinforced, tear-resistant mesh. Not intended for long-term outdoor use (more than two (2) hours), as UV exposure and/or heat for extended periods can degrade the product. Rugged, reinforced polyethylene top layer (yellow) provides protection from extended UV exposure and vehicular traffic. Clear material provides unobstructed view of covered drains - enables responders to make sure a complete seal is made. No more guesswork about Drain Seal effectiveness - quickly see if spills are entering the drain through cracks in the surface, imperfections in the grating, or other irregularities that can break the seal. Installs quickly and easily to trailer undercarriage � hardware included. Tethered fastener secures end cap � allows quick and easy access. Our Drain Seal is manufactured with Reinforced mesh is "sandwiched" between layers of polyurethane - increases durability and resistance to tearing. Unique, urethane construction allows the pad to deform and seal off most drains � temporarily "seals" to any smooth surface. 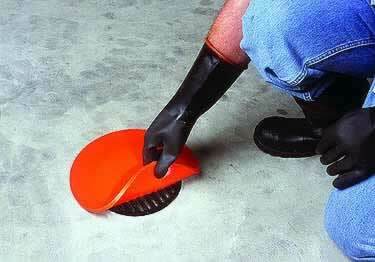 Unlike some alternative products, BOTH sides will quickly seal drains - there is no specified "top" or "bottom".